This experience will give the novice horse lover a full understanding of what its like to own their own horse! 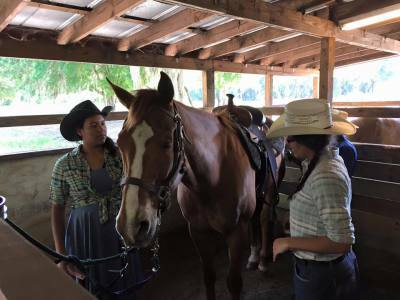 This adventure includes a hands on grooming and tacking (saddle/bridle) session, a riding lesson and games in the arena, a 1 hour trail ride and an untacking, brushing and horse bathing session, followed by horse treats for your new friend. Participants are encouraged to ask questions, tour the barn, take photos and meet all of our other farm animals. We'll even let you muck some stalls if you want to! By the way, you will get dirty! 2+ hour experience - $125 per person •	Advance reservations are required by calling or texting 407-414-3113. •	The minimum age requirement for riders is 8 years old. •	The maximum weight limit for riders is 225lbs. •	All riders 16 and under are required to wear a helmet. •	Close toed shoes are required. Hats, sunglasses & sunscreen are suggested.